A few weeks ago I read Tom Standage’s Writing on the Wall, which argues quite convincingly that there are analogues of social media (that is, ways of sharing information through personal networks) going back 2,000 years in history. From that point of view, there’s more continuity between how we communicate now, and how we used to, than one might suppose. But I’ve had cause to think about these issues again after reading a couple of new books from Canongate which are all about the history of letters. I’ve been wondering whether there is something unique about letters that might potentially be lost. Simon Garfield has written a number of acclaimed non-fiction books (including 2010’s Just My Type, a history of typography, which I have been meaning to read for ages). His new book, To the Letter, is subtitled ‘A journey through a vanishing world’; so we know that this isn’t going to be just a factual account but – well, a love letter to letters. ‘Letters have the power to grant us a larger life,’ says Garfield (p. 19), telling of how he became intrigued by the story of a magician named Val Walker, after discovering a set of Walker’s correspondence for sale at an auction. There are similar glimpses of different lives and stories throughout To the Letter, as Garfield weaves together the history of postal delivery, the contents of letter-writing manuals, and notable correspondents from throughout the centuries, all into a fascinating tapestry. If, like me, you have ever enjoyed writing or receiving letters (or both! ), there will be plenty to delight you in Garfield’s book. But also, there will almost certainly be something to cause a feeling of regret and disappointment; for me it was learning that the Postman Pat theme has been changed so he brings ‘parcels to your door,’ rather than letters. (Now I look into this further, it seems that the change came about because the new series is about Pat running a parcel delivery service, which alters my view a little, though I suppose it’s still illustrative of a general trend.) The thing is, though, that I’m really just being nostalgic for the trappings of the physical letter here; if I want to get to the heart of what letters really represent, I think I need to go deeper than that. Tom Standage’s first example of historical social media in Writing on the Wall is Cicero staying in contact with Rome by copying and sharing letters, some of which were intended to be public documents. Garfield also has a chapter on the Romans, but he make a distinction between the public (in a sense performative) correspondence of a Cicero, and the letters of someone like Pliny the Younger, which were generally more private. The sense of letters as a private and personal space comes through time and again in To the Letter, perhaps never more so than in the wartime correspondence which intersperses the book. Chris Barker (an RAF communications officer stationed in the south Mediterranean) began writing home to his friend Bessie Moore (who translated Morse code messages for the Foreign Office) in 1943; as time went on, their friendship turned to love – and the expression of that love as we see it in their letters is deeply affecting. I was as captivated by the tale unfolding in their correspondence as I could have been by any fictional story. Perhaps this is what the personal letter fundamentally represents: a space for an extended, reflective engagement between two individuals. This is something that can also be accomplished by email, of course; but I do think that the act of physically writing a letter encourages it more. Either way, Simon Garfield’s book leaves me appreciating letters anew, and thinking that perhaps I should write more of my own. The quotation heading this post is from Pliny (as mentioned by Garfield); I think it’s correct, but I was also struck on reading To the Letter (especially the Barker-Moore correspondence) at how letters can turn history inside-out, can give a view that one might not see otherwise. That feeling was brought to mind again when I read Letters of Note, a book based on Shaun Usher’s website of the same name. This book was published in association with the crowdfunding site Unbound; so that’s an online service used to facilitate a printed book derived from a website that celebrates paper correspondence – phew! Letters of Note reproduces the text of 125 letters, often alongside images of the actual documents. It’s a big, beautiful object. It is also wonderful to read. There are the amusing entries, such as the young Queen Elizabeth II sending President Eisenhower her recipe for drop scones; or an eight-year-old boy’s letter to Richard Nixon (who was recovering from pneumonia at the time) urging him to ‘be a good boy and eat your vegetables like I had too!!’. There are letters which, as I said earlier, open up history in a way that only personal documents can: Francis Crick’s letter to his young son describing the newly-discovered DNA molecule; or a Japanese lady’s farewell to her samurai husband, whom she was sure would fall in battle. There’s the poignant and the inspiring, the romantic and the furious. I could go on, but Letters of Note is something you really have to experience for yourself. It’s difficult to imagine a better demonstration of the power and value of written correspondence. Now seems a good time to talk about what I’d imagine to be one of the most powerful epistolatory stories in the English language. Kathrine Kressmann Taylor’s Address Unknown was first published in Story magazine in 1938; I read it this year in a stand-alone volume published by Souvenir Press. It takes the form of a correspondence between Max Eisenstein, a Jewish American gallery owner; and his old friend and business partner Martin Schulse, who has recently returned to Germany as the tale begins, in 1932. At first, Schulse is hopeful for the future of his country under Hitler, but also expresses his reservations to Eisenstein. Schulse’s attitude soon hardens, though, and he orders Eisenstein to stop writing. The American attempts to appeal to his old friend’s better nature, but Schulse will have none of it – until events take a tragic turn, and the letters become weapons. I think it’s the epistolatory form that really makes this story; Taylor brings together the personal and performative aspects of letter-writing, using both to cutting effect. We see the changing nature of the two men’s relationship, and sense the deep personal connection that Eisenstein wishes were still there (and that letters can forge and capture so well). 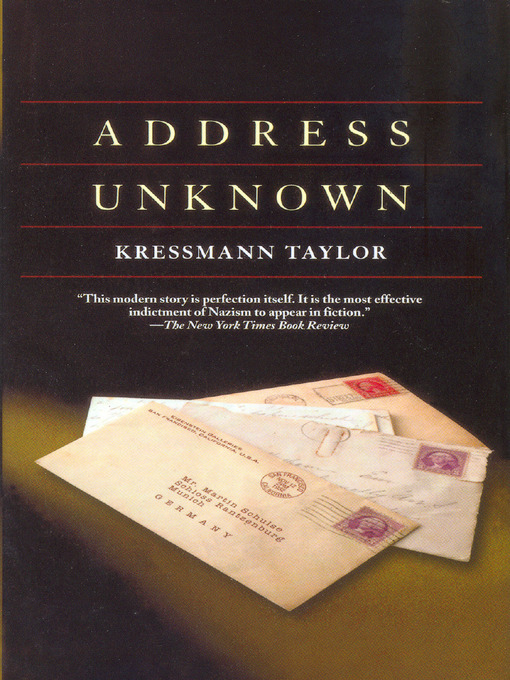 But I’m also struck by how much the letters in Address Unknown don’t show – how they filter out certain aspects of their thoughts. I’m thinking especially of the ending, where the letters advance implacably (you’ll have to read the book to see what I mean), and we have to infer what must be in their writer’s mind. Letters may be able to forge a connection between two people, but Taylor’s story shows how they might also sever one irrevocably. To be honest, I’d forgotten it was based on a piece of written fiction. I must try to get hold of the volume you mention. Interesting that there is this new literary journal The Letters Page started by Jon McGregorwhich focuses on the letter. He seems to have opted out of email altogether and gone back to the letter, though not everyone appreciates it and some have accused him of wasting people’s time. Kind of sad that we are no longer able to to indulge something that used to be so valued and is now considered to be a waste of time. I hope it is successful. I do think that there something unique to a handwritten letter that doesn’t exist in a computer generated text just as speaking to someone on the telephone isn’t the same as being with them face to face. It is to do with what they trigger inside, mentally and perhaps even our chemistry – sitting in front of a screen and writing an email or opening a word document has a number of different associations that provoke memory or feelings that inhabit us when we create. Often a computer screen is a portal to distractions, just as being at home can be distracting if we need to work, when there is washing to do, interruptions by family etc, that ever unquenchable thirst. In my mind, I associate letter writing, the old fashioned hand written version, with a kind of freedom, like a free mental space to inhabit where you find that person you are focused on and you remember their energy and times you may have spent together or imagine having again and you know which of your own obsessions they will be interested to hear about, things you may not share with everyone, but know that in a letter you have a receptive audience and importantly one that doesn’t interrupt. It is also why I often take a notebook with me when I am working, because I don’t work 9-5, I work from appointment to appointment and travel in between, I often find myself somewhere far from home with an hour to spare and this is valuable creative thinking time and time when I often write book reviews, because there is nothing else to be distracted by, no work, no home, no family, no obligations, pure freedom. Long live the letter I say.